A compact and robust DAW controller that works on its own or alongside further Platform fader expanders. Basic but reliable. A little bit limited in terms of features. The Platform M+ is an updated version of Icon’s universal DAW controller, and offers a simpler and more affordable controller solution than its flagship QCon Pro X. 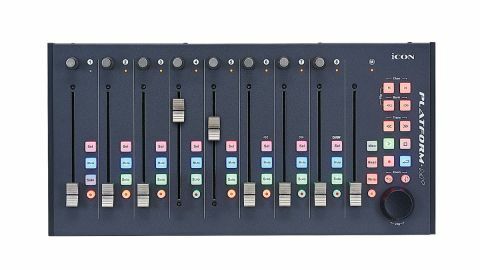 At 20cm from front to back and just 4.5cm high, the M+ is pretty slimline, which is good news as you can add up to three further 8-fader extenders (Platform X+) and LCD displays (Platform D) for a 32 channel plus 1 master fader rig. The build quality is excellent and, although small, it is pretty weighty. Interfacing with your computer is via USB 2.0, with further proprietary connectors on the back for the Platform X+ and D expansions. Power is via an external PSU. Platform M+ supports Mackie Control and Mackie HUI protocols for use with a range of DAWs. It also incorporates presets for specific DAWs, which you select at power up, and there’s one user- definable preset. The manual includes instructions for the required DAW side settings, and we found set-up with the DAWs we tried (Logic X and Studio One) very straightforward. The M+’s feature set is pretty simple and functionality is universal across DAWs. Each of the eight channels includes a touch-sensitive 100mm motorised fader for channel level, a push button rotary encoder for panning, and four backlit push buttons. The buttons are for channel select, mute, solo and record enable, and are coloured red, blue, green and red. There’s also a touch-sensitive 100mm master fader, although this has no further associated buttons. Channels can be selected using the channel select button or will pick up automatically from the fader, and for the latter there’s a red activation LED next to the channel number. On the right-hand side there are a number of backlit buttons handling bank and channel navigation, mixer window selection, DAW transport and automation modes. At the bottom there’s a push button jog wheel that also combines with the dedicated horizontal and vertical zoom selectors for wheel-based zooming. Finally a lock button stores the fader position. Platform M+ focuses on key universal functions, so there’s no attempt to tackle more complex tasks such as plugin editing. We did find some differences between DAWs though, and one good example is the mixer button. This normally opens the DAW mixer, but in some cases it takes on a different function. Finally, Icon produce a support app called iMap, currently available for Windows, with an OS X version to follow. This assists with firmware updates and controller assignments for the user-definable preset. Overall the Platform M+ performed very well and, although the feature set is pretty simple, you have to factor in the reasonable price.